At a glittering awards ceremony in Monte Carlo on 25 November, another memorable chapter was added to the Springboks’ good-news story of 2018 as Aphiwe Dyantyi was named World Rugby’s Breakthrough Player of the Year. When the announcement was made, Dyantyi clasped his hands together in a show of gratitude, and there was a clear air of emotion as he accepted his award in front of a room filled with past and present stars of the game. ‘I’m still shaking from disbelief, but above anything I’m just honoured,’ he said. ‘I’ve always watched people get these accolades, and I never imagined I’d be the one sitting here. It’s really been a blessing. In many ways, Dyantyi has redefined the term ‘breakthrough player’. The tale of his journey to international sporting stardom has become increasingly well told, but it remains as compelling as ever. It’s a story of a player who made it to the top via a wholly unorthodox route. No 1st XV selection in high school. No U18 Craven Week exposure. No SA Schools. No Junior Boks. Just sheer, raw talent and a steadfast spirit. As a promising teenage talent, Dyantyi went to the reputable boys high school Dale College, but any traditional rugby tale stops there. After failing to make the 1st XV in Matric, he walked away from rugby and began to focus on his tertiary studies. It wasn’t a decision made with petulance or resentment, but rather a clear-minded acceptance that perhaps his future lay elsewhere. For Dyantyi, his move to the University of Johannesburg was seen as an opportunity to make a fresh start, and he duly threw himself into his books – having since qualified with a BCom Honours degree. But he eventually found himself drawn back to the rugby field on a social basis, helping out by playing for his koshuis (residence). 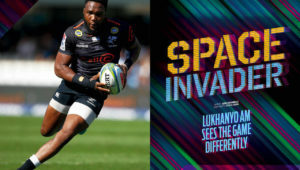 A couple of fateful encounters saw Dyantyi tempted into giving competitive rugby another go, while also letting go of his youthful preference on making it as a flyhalf or fullback, where he had enjoyed being closer to the action. The rest is history. Very quickly Dyantyi rediscovered his love for the game, starring for UJ in the 2017 Varsity Cup before being drafted into the Golden Lions’ Currie Cup squad. Featuring on the right and left wings, the speedster featured in all 13 of the Lions’ domestic games in 2017 – scoring six tries. It was a period that underlined his immense potential, but at the start of 2018 he was hardly a household name. Yet, over the course of a quite remarkable year, he set the rugby world alight, culminating in a richly deserved World Rugby award. Before reflecting on the achievements of an unforgettable 2018, it’s important to appreciate where the journey began. Born and raised in the Eastern Cape, Dyantyi grew up in a sports-mad household, with him and his three brothers constantly playing competitive games together in their backyard. One of his siblings, Bongani, chuckles fondly when recalling the antics of the energetic brothers. ‘All four boys are very ambitious and competitive. We would put our hearts and souls into everything we did, and playing sport was one of them. If you look at the way Aphiwe plays, it’s with high intensity; he’s not shy to get stuck in and make his presence felt,’ he says. Rugby was just one of the sports where Dyantyi quickly developed an aptitude, going on to represent the Border Bulldogs as a flyhalf at the U13 Craven Week in 2007. At Dale College, Dyantyi dreamed of playing for the 1st XV in Matric, which was also coincidentally the year of the school’s 150th anniversary. However, the ambitious teenager failed to crack the nod. In fact, he ended up playing in the 3rd XV, and readily admitted it was something he took quite badly, as he began to question the mixed messages he’d received. During this time, though, Dyantyi maintains he always retained the support of his family and brothers, who encouraged him to just keep enjoying his rugby. 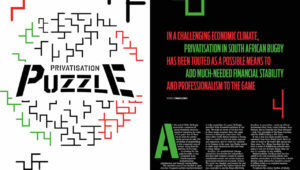 Bongani offers a wry chuckle when reminded of this time. ‘In some ways, I think the fact he didn’t play 1st XV rugby for Dale was a blessing in disguise. Aphiwe always had the talent, but I think that setback helped give him an extra push in the long run. It makes the story all the more remarkable when one reflects on the fact Dyantyi made a conscious decision to quit rugby after high school. Having made the move to Johannesburg, he began to excel at soccer, even featuring for the UJ 1st XI. However, once Dyantyi had decided to give rugby another go, he quickly sped through the ranks. It also didn’t take long for him to emphatically announce his arrival on the Super Rugby landscape in 2018. In an enthralling clash against the Jaguares at Ellis Park on 24 February, he received the ball well within his own half, blitzed through three attempted tackles and delivered a searing sidestep to beat one final covering defender on his way to scoring under the posts. He has not looked back since. Besides finishing the season as the Lions’ joint top try-scorer (seven), he would go on to earn a Springbok call-up for the June Test series against England, where he scored a try on debut at his home ground. The fleet-footed wing backed that up with a memorable two-try display in the Boks’ Rugby Championship opener against Argentina in Durban. He further underlined his class with a dazzling display as South Africa clinched their first win in New Zealand since 2009. 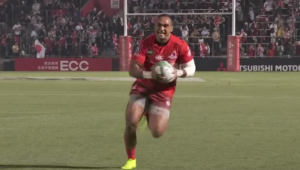 Dyantyi not only secured a brace of tries – twice sidestepping Beauden Barrett – he also made the match-winning defensive intervention with the final play of the game. For Dyantyi, it was the sort of mesmerising performance made all the more impressive by the high-pressure environment it came in. Playing in just his seventh Test match, he completed 39 running metres, four carries, three clean breaks and made five tackles to go with his two tries. Such a start to his Test career has seen Dyantyi draw inevitable comparisons with Bok legend Bryan Habana. And while the 124-cap Bok is understandably one of Dyantyi’s heroes, it’s clear the 24-year-old is determined to continue blazing his own trail. ‘I’m really flattered by such a comparison,’ Dyantyi says. ‘He’s an absolute legend in his own right, and he proved himself on the biggest of biggest stages, year after year. It’s a feel-good story made all the more captivating by the fact Dyantyi has gone from giving up the game, to being named as World Rugby’s Breakthrough Player of the Year. When asked to reflect on this course of events over the past few years, he provides an answer that offers real insight into the character of a young man who appears destined for greatness. ‘It comes from the adrenaline I feel in the moment, but the story behind it is that when I was growing up, I watched a lot of rugby with my brothers. As with any spectator, one of the greatest moments is marvelling at the haka, and it was no different for me. Watching Tana Umaga lead the first Kapa O Pango haka in 2005 with so much passion, I kind of got it from there, and then I tried to take it and make it my own and incorporate it into who Aphiwe is. 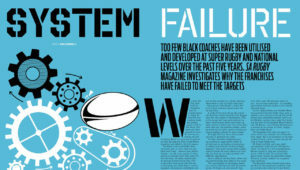 – This article first appeared in the January 2019 issue of SA Rugby magazine.